Collaboration between Emory Healthcare and Southern Regional Health System is under way to increase patient access, integrate programs and plan for future expansion, says Emory Healthcare CEO John Fox. 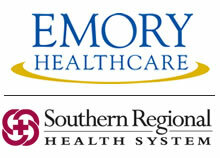 The Southern Regional Health System announced today that it has reached an agreement with Emory Healthcare on a management services agreement. The agreement, which is effective October 1, defines the structure of an affiliation between the two health systems to preserve and enhance high-quality health care for residents of the Southern Crescent. "Formalizing a management agreement is key to Southern Regional working in the Emory Healthcare network of providers," said Jim Crissey, president and CEO of Southern Regional. "Over the next year, we'll undergo the greatest transformational change in the organization’s 41-year history as we strive to implement many of Emory's quality programs and operational standards. Our community expects the best, and they deserve it. Adding Southern Regional into the Emory network of hospitals delivers on that expectation." Southern Regional’s quality programs will blend with Emory's, and Emory will work on implementation of its quality programs and initiatives at Southern Regional. Southern Regional’s quality, financial and operational direction will be established with guidance from Emory Healthcare, but with governance remaining with the current SRMC Board. Emory Healthcare will strengthen physician partnerships and its presence in the Southern Crescent, while increasing access for patients. Collaboration with some of Emory University’s health-related education programs will be available to Southern Regional in the future. "The addition of Southern Regional as a formal partner in Emory Healthcare's Clinically Integrated Network enables us to formalize our already strong partnership," said John Fox, president and CEO of Emory Healthcare. "Collaboration is under way to increase patient access, integrate programs and plan for future expansion, all of which will benefit those who live in the Southern Crescent area."